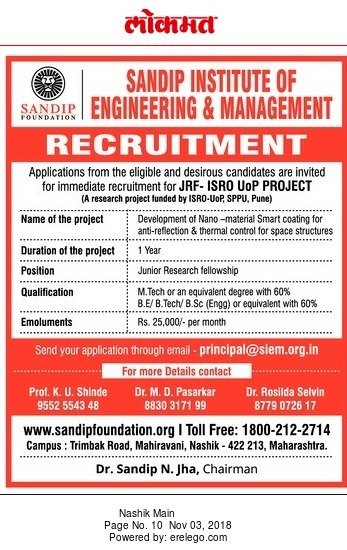 Sandip Institute of Engineering and Management, Nashik, maharashtra advertised Officially for Research jobs 2018 – Junior Research Fellow Jobs. For More Details see below. About University : Sandip University is an autonomous educational university guided and governed by the policy, rules and regulations of Maharashtra state and under the regulations of the University Grants Commission. This is the first Self-financed private university in North Maharashtra. Sandip University belongs to Sandip Group of Institutions which owns the very well-known Sandip Foundation in Nashik. Sandip University is a massive educational institute In Nashik aimed at providing quality Undergraduate and Postgraduate programs to the students.